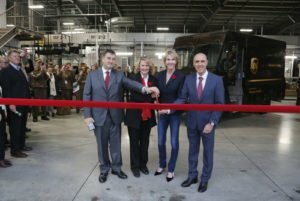 MISSISSAUGA, ON – On November 2, UPS Canada unveiled a new facility in Kanata, Ontario, to help meet increased demand and serve additional areas in the Ottawa region. This investment is part of the larger UPS $500 million investment in Canada. Kelly Craft, the U.S. Ambassador to Canada, Karen McCrimmon, Member of Parliament for Kanata–Carleton and Emmanuel Kamarianakis, Director General of Investment and Innovation, Global Affairs were in attendance to help celebrate. During the opening event, Christoph Atz, president of UPS Canada discussed continued growth in Canada and the company’s commitment to serving the communities in which it operates. The new 40,000 sq. foot facility is primed for future growth, with the capacity to sort 3,000 pieces per hour. It is equipped with an on-site propane fueling station for our alternate fuel vehicles and all interior and exterior lights are LED to help conserve electricity use.